Both this playground and the nearby street are named in honor of Corporal William F. Kennedy (1893-1918), an army mechanic killed in action during World War I (1914-1918). Kennedy was born and raised in Bayside, where his father was a police officer. After the war broke out, he joined the army, and began training at Fort Upton, the present site of the Brookhaven National Laboratory on Long Island. He was then stationed in France, where he served as a mechanic with the 107th Infantry Regiment, 27th Infantry Division. On September 30, 1918, Corporal Kennedy was killed while out on maneuvers. He is buried in the Somme American Cemetery in Bony, France. World War I took the lives of over 8.5 million people, including 57,476 Americans – 13,956 New York State residents and 7,455 inhabitants of New York City. Monuments to those who lost their lives are located throughout the city, and several roadways and parks are named in their honor. Corporal Kennedy Street is a stretch of roadway from Little Neck Avenue to Northern Boulevard on which Kennedy once lived. The roadway, formerly Gardener Street, was renamed by a local law on April 21, 1925. The City acquired the Kennedy Playground site in 1931 as part of a $95,000 purchase intended for the creation of a public playground and thoroughfare. In 1933 and 1934 the western parcels of the property, now bounded by 208th Street, Corporal Kennedy Street, and 32nd and 33rd Avenues, were transferred to the Board of Education for the construction of Bayside High School. The remainder of the land was landscaped with lawns, shade trees, and sidewalks with funding provided by Queens Borough President George U. Harvey. The playground opened along with six other new playgrounds on November 22, 1935. 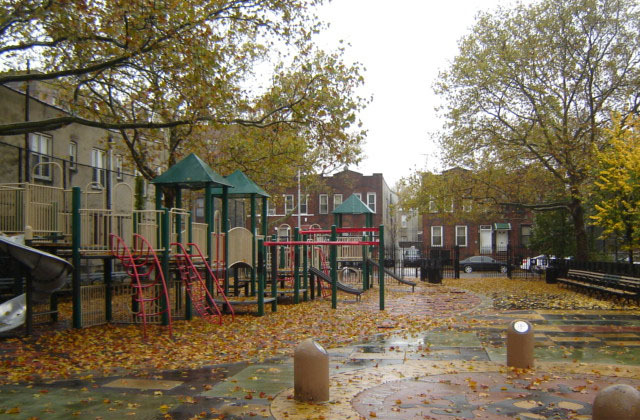 In 1997, Kennedy Playground underwent a $480,000 renovation, funded by Council Member Michael J. Abel. The reconstructed facilities include a swing set, two new sets of play equipment, and spray showers with seal animal art.